I feel for restaurant owners on opening night. 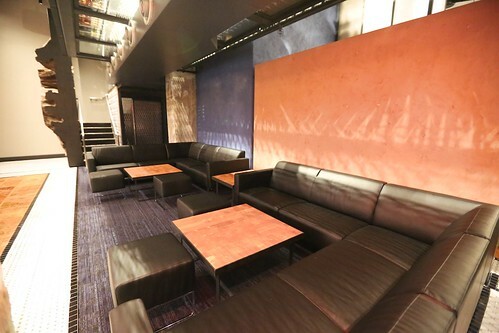 Despite what often seems like glitz and glam from the outside, I can only imagine how difficult it must be to open your doors for the first time and invite in hoards of San Francisco sophisticates with high expectations. 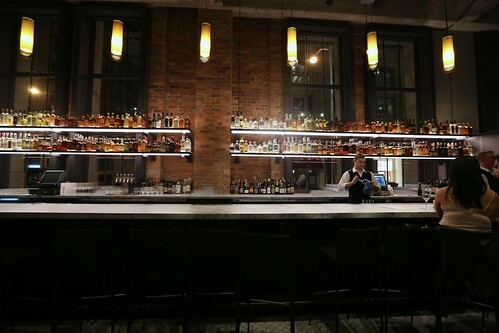 Yet when Mourad Lalou opened his latest project, Mourad, in San Francisco's neo gothic Pacbell Building in SOMA last night, he did so with seeming ease. Service seemed calm. And the cocktails—of course my interest point here—were elegantly executed. The opening menu is put together by Christ Aivaliotis, of consulting firm Wizard Oil. 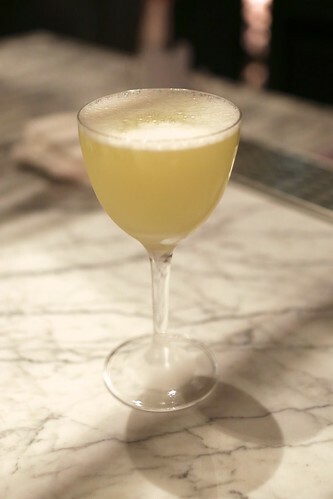 After getting his start with Erik Adkins at Flora, Christ opened a cocktail consultancy with his business partner Tory Bayless and was brought on to create the program at Mourad. 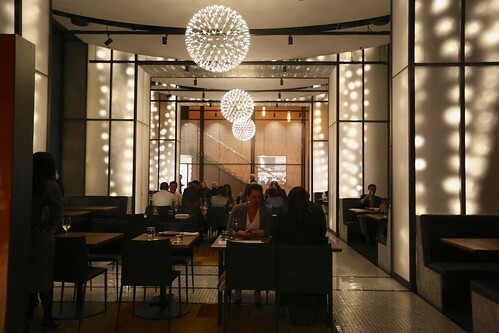 It's a simple, but well constructed, menu with cohesive flavors and a touch of spices to go with the restaurant's theme—which, like its Michelined sister Aziza, focuses on Morocco. The restaurant is an impressive stage for cocktails. The layout is designed to resemble a traditional Moroccan home, which grows in intimacy as you move from the front to the back. It starts with the living room and opens up to the main dining room. The staircase in back looks like it could move into a bedroom—in actuality another dining room. 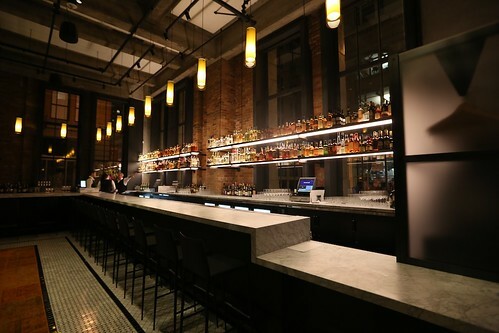 The bar itself is granite-topped and so long that it curves into an L. The backbar is impressively large and rises above the counter with modern, minimalist shelves. On the Spot - rye, nocino, manzilla, triple sec. 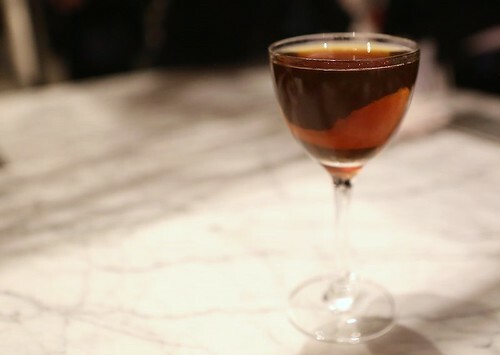 A smooth and stirred drinks with velvety elements of fig from the sherry. 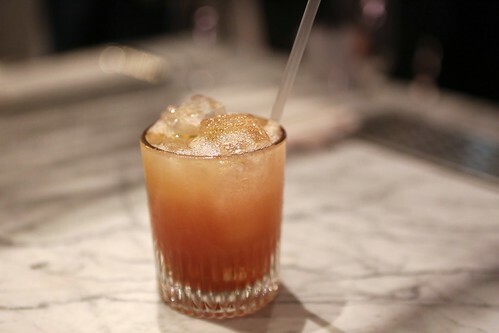 Calgula's Kiss - rum, cherry liqueur and lime. Bright and refreshing. Not too sweet. Baco: tequilla, pineapple, lime, cinnamon, herbsaint. It's bright, sweet, slightly buttery (from the pineapple), and cohesive. 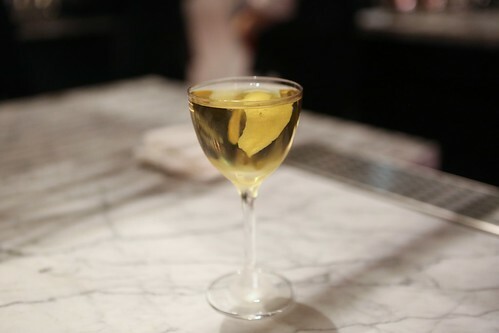 Chrysanthemum - Benedictine, French vermouth, and Elisir mp Roux (a herbsaint from Provence, France). It's a sweet drink that tastes like honey suckle, though the texture is still light and not viscous. 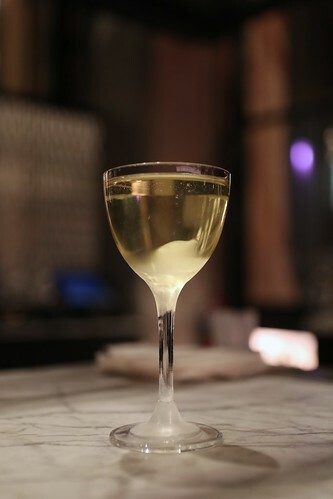 The drink is relatively low ABV, and tastes like a milder, sweeter martini for those who like the flavor profile of the classic drink with less aggressive notes. 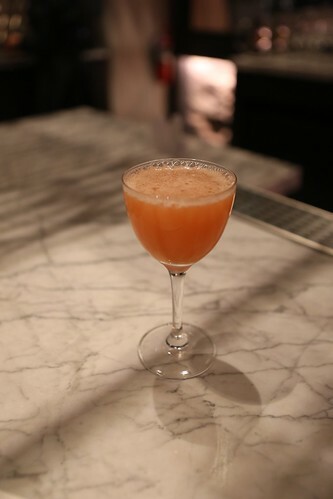 Old Blanco Daisy - pisco, pomelo, and tonga mix made of real passion fruit, real lilikoi. The tonga mix is made made of pomegranate, orange peels, and pomelo. They also had real lilikoi seeds for sweetnss and texture. Though it sounds sweet, the pomelo balances out the drink with a touch of bitterness. Copa Gibson - A classic mix of Sipsmith Gin, bitter, and onion. Salt and Pepper - gin, lemon, grapefruit, bitters. 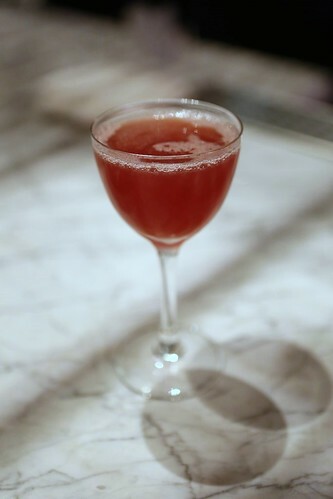 They use Broker's gin in this drink, which is dry and botanical—a good match to the grape fruit and bitters. The Mai Tai at the Halekulani is easily one of the most legendary cocktails in Honolulu. Lesser known, however equally mythic, is the same five-star hotel’s Bloody Mary. While not listed on the menu, those who know about it can order it at the House Without a Key, the hotel's historic outside patio with famous views of iconic Diamond Head and, around sunset, a live Hawaiian band and hula dancer. But just because the myth isn’t true doesn’t mean the drink isn’t quite simply delicious and, in fact, the recipe still has a twist. According to the staff, the Bloody Mary makes use of the most classic ingredients: tomato juice, horseradish, Worcestershire, tobasco, celery salt, and—adding one more special touch—au jus. It’s a great idea in concept. Mixing in the rich savory juices from beef gives deep complexity to the spicy drink. What’s alluring in practice is that the Halekulani also happens to be home to La Mer, the most elegant French restaurant on the island. The food there is exquisite and expertly crafted, enjoyed by patrons in the quiet dining room with pristine views of the Pacific. Au jus from potentially La Mer in my Bloody Mary? Yes, please! The result is a satisfyingly sweet, briny, savory, and slightly spicy Bloody Mary served with a generous celery stick and a lime wedge. Guests can choose from vodka or gin. 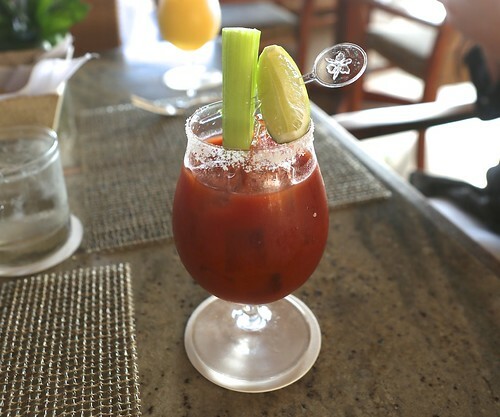 Unlike many other Bloody Marys which easily veer too spicy, too acidic, or too rich, the Halekulani’s well-balanced rendition is easy to enjoy to the last drop and is a ready companion to the sweet, round tunes of a Hawaiian band and the winter’s swollen sunsets, all found at House Without a Key. Inspired by my interest in the Bloody Mary recipe, one of the friendly waiters did offer his friend’s favorite mix for making the drink at home: V8, A1, and tobasco sauce. Yet another concoction that I will perhaps have to try some day.